The Turkish logistics sector has attracted around $1.9 billion foreign investment in the last 10 years, International Transportation and Logistics Service Providers Association (UTİKAD) Chairman Emre Eldener said yesterday. 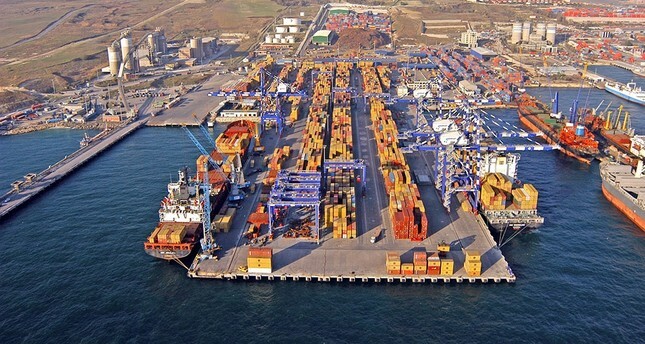 Stating that the logistics sector in Turkey experienced a four-fold increase in load capacity and saw an increase in the container volume as well, Eldener said the sector, which provides jobs to around 400,000 people, is an important employment area for the country. Speaking to Anadolu Agency (AA), the UTİKAD chairman said the sector aims to obtain as much share as possible from the global logistics sector, whose volume has reached around $7 trillion. Eldener underscored that the sector has a capacity to carry the load of the Turkish economy toward its 2023 vision goals. "The share of the logistics sector in Turkey's GDP [gross domestic product] has reached around 14 percent. The volume of the sector's operations in the country has reached TL 150 billion [$39.8 billion]," he said, adding that the road transport in Turkey has been used more than other means of transport. "In our country, which has one of the biggest vehicle fleet in Europe, there are more than 800 trucks registered in traffic, according to the Turkish Statistical Institute [TurkStat] data. However, it is not right to assume that all of these vehicles are currently used for international transportation activities. When we look at airline transportation, the General Directorate of Civil Aviation data shows that the aircraft fleet of our country is 540. When we examine the global data, we see that 1 percent of the transports are carried by air, whereas in the sense of value, this volume corresponds to 40 percent," said Eldener. Indicating that air transport is preferred for valuable cargo, Eldener said with the opening of the first phase of the Istanbul New Airport, which is scheduled to open on Oct. 29 this year, Turkey might become a major transshipment center in terms of air transportation. Eldener also said 90 percent of the global load is being transported by sea, underscoring that Turkey, with its 8,400 kilometers of coastline, has an important role in terms of the east-west and north-south trade corridors. When the sea transport data is examined in Turkey, around 400 million tons of load was transported until the end of October 2017, said Edener. It is possible that large increases will be observed in these figures due to the fact that China's Belt and Road Initiative sea leg will gain functionality through Turkey, said Eldener. "On the other hand, the fact that our country has become a center of attraction for port investments and the construction of harbors that allow the docking of large cargo vessels will also stimulate these figures positively. In addition to these modes of transport, we must also mention the railway. In our country, we have the companies that have the financial strength to operate their own locomotives and wagons with the liberalization of railway transport," he added. Eldener also indicated that the machine parts, electronic equipment, precious metals, iron and steel, automotive and textile sectors have a positive effect on the growth of the international logistics sector in Turkey. Eldener referred to many infrastructure and transportation projects such as the Istanbul New Airport, the Baku-Tbilisi-Kars Railway, Asiaport, Safiport, DP World Yarımca and the liberalization of railways, explaining that these developments will expand Turkey's foreign trade capacity in line with the country's 2023 vision. Therefore, he emphasized, the country wants facilities to enlarge the logistics capacity and human resource to be employed in unleashing that capacity.